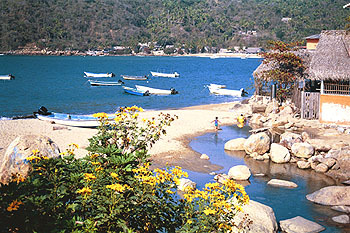 Yelapa is the jungle paradise, with the perfect climate and friendly natives that, for many, is a dream come true. Yet the ease of access (45 min water taxi ride from Pto. Vallarta or 30 min from Boca de Tomatlan) and affordability, make it attainable in this life! On the rugged Pacific coastline of Mexico, it's hard to find calm waters. 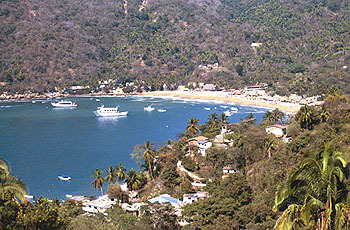 Yelapa offers a large sheltering bay and an extensive sand beach at the mouth of the Tuito River. The village on one side of the bay, and the rural community along the river includes about 1500 of the friendliest people in Mexico. Perhaps it's the lack of stress - with no roads or cars in the village, life is a leisurely pace. Everyone walks or rides donkeys (burros), mules (machos) or horses. It's a social outing just getting to your destination, as greetings and "the news" are exchanged. The only access is the water taxi (panga) ride that provides an affordable tour of whale-filled waters and other quaint, coastal villages. Even the King of Spain in 1581 seemed partial to this peninsula, granting it to the indigenous peoples as a reserve in perpetuity. Yelapa is one of 13 indigenous villages still self-governed and policed within this reserve. Yelapa was settled only in the early 1900s from the adjacent mountain communities, although relicts of pre-hispanic tribes are still occasionally found. In this century, Yelapans collected coconut oil for sale, mined for gold, collected latex (chicle), fished, farmed and ranched. Now, ranching and fishing continue, with the economy largely oriented to tourism. The Village - The village hugs the south coast of the bay, with a small quiet beach and a dock for arrivals. Local boats supply the community, and a flotilla of perhaps 20 boats may be anchored awaiting service. Industry in town revolves around three small grocery stores (tiendas), five restaurants, a new Tortillería and Water/Ice Factory, a pool hall/bar, a Salon de Fiestas, the Club de Yates and, of course, the church. Each restaurant has its specialties, with Pollo Bollo's barbecues the most popular, Ramona's for tacos and a movie, Mimi's or Andy's for all around great Mexican food, and Elena's at the Yacht Club serving gourmet selections with organic salads. Up the small river in town 10 minutes walk is "the Waterfall". Busy mid-day with tour groups, but a relaxing retreat from the main village itself any other hour, this is a cool niche to retreat to. The small family restaurant offers fantastic breakfasts, mid-day meals and drinks until 5 p.m.
Upriver - Up the main Tuito River, back of the beach scene, is residential El Paso with two small grocery stores supplying local needs, and locals raising farm animals for subsistence living. The river itself is sand-banked with huge boulder, many deep pools, interspersed with women washing clothes, blooming water lilies and birds. It's a very relaxing way to spend the day, visiting and chatting with the rural Yelapans.. About 25 minutes upriver, is the Riverside Cafe, run by a naturalized American, with home-grown garden fresh vegetarian Mexican meals and fresh fruit aguas. One hour upriver along the footpath, is the "Cascadas and Catedral", the waterfalls and cathedral (or canyon), a popular destination off the main trail with deep pools amidst the jungle sounds and sights. Numerous other equally great deep pools and waterfalls are found with a little more walking upriver. The largest falls are almost 3 hours upriver, with 3 separate pools and a combined falls of nearly 60 ft. Great for a backpacking destination overnight, by burro or for the fleet-footed. Unique Features- Yelapa offers the visual charm of the palm thatched-roof houses, many that are completely open to the environment (no windows, or doors), unique to this coast. In addition, swinging beds are quite common, and with the sounds of the surf and jungle life, guarantee a great night's sleep. The climate is hot, no one locally reports the temperature. Yet there are seasons, with December river pools delightfully cool and nights that often require additional bed covers and comfortable fleece jacket and pants for evening wear. Spring fever is rampant as the hills are covered with blooms from various trees from mid-February on. The hot summer weather begins in earnest in late April and warms even the ocean to bathtub temperatures. The whale-filled Banderas Bay and Yelapa Bay offer endless unexpected hours of viewing pleasure from almost any vantage point. The Tuito River is a rare jewel of pools, falls and sandy banks, with jungle to the edge, birds and animals sighted regularly, river "shrimp" or crayfish for the picking. Casa Isabel offers a variety of unique ocean-view accommodations, their privacy ensured by lush shrubs and flowering vines planted a long time ago. Huge trees form a jungle canopy over an enchanting garden hillside right on the beach and just a five minute walk west of Yelapa, a rare little town with no cars and a healthy Mexican culture. Magic Moments in Yelapa Jalisco, Mexico, a place suspended in time, with no roads or automobiles, just friendly folk and luscious flora and fauna. Gracious old style double "Palapa" with 3 queen beds and 2 bathrooms set in a large private jungle garden. Fully equipped kitchen in the main house; auxiliary guest house. 2 minutes down the hill to swimming. 7 minutes to shops and restaurants. Yelapa has great restaurants! Horseback riding, snorkeling, paragliding, hammocking and beach time abound.